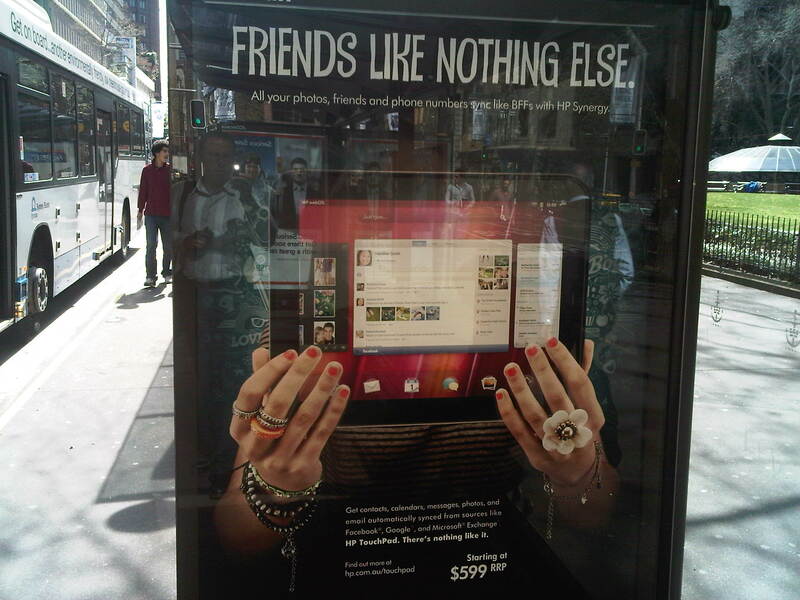 I took this picture on Monday, one of many bus shelter signs in Sydney’s CBD advertising the just-defunct HP TouchPad for sale at Australian retail store Harvey Norman. In fact, the device had already been cleared off the shelves in a fire sale the week before – I know, because I picked up one of the 32GB models for $149 at my local store. Having organised bus shelter advertising in the past, I know how difficult and expensive it would have been for Harvey Norman to cancel the ads or produce replacement posters. That said, it might prove to be a great strategy, now that word is out today that HP is going to produce another batch of TouchPads … but at what price point and where they will be sold, nobody knows. At the same time as HP’s news, there is talk of an Amazon tablet, with analyst firm Forrester predicting it will be released at a sub-$300 price point. The decisions being made by HP and Amazon are obviously having a destabilising effect on the tablet market, but it’s really no different to what happened with mobile phones. In their early years, mobiles were incredibly expensive – almost $4000 for a Motorola DynaTAC 8000X in 1983 – but for most handsets now (barring the top-of-the-line smartphones), the value is all in the contractual plan you sign up for with the telco. Apple’s managed to flip that model on its head and charge a premium for the iPhone, by making content – apps and multimedia – are more compelling proposition for consumers, but I reckon it’s only a short-term advantage. When it comes to tablets, it’s all about content – over time, the device itself will become a commodity, like the paper used to produce books, and have little intrinsic value in itself. HP made a pretty good start with its Pivot apps magazine on the TouchPad – it’s just a shame to see all that time and effort put into the content likely to go to waste with the eventual demise of the device. Digital content reminds me of all the excitement around PointCast 15 years ago. PointCast was an application that you ran on the desktop that delivered up-to-date news and information that you could personalise to your own needs. In some ways, it was probably 15 years too early. A PointCast-style model, licensing content from various news services and pushing it out through a tablet app, would stand up really well now. As the price of the tablet comes down, in a couple of years, I can see the content owners themselves releasing their own tablets. Imagine a Gourmet Traveller or Vanity Fair-branded device, that gave you access to the entire back catalogue of magazine issues, plus an ongoing, paid subscription to future editions, together with some basic web and communication capabilities. On your bookshelf, instead of a stack of magazines and newspapers, you just have a short row of tablets, their titles visible on the spine, resting on a charging pad. I think your spot on with the last paragraph. As the devices get cheap enough you can bundle device and content and gift it. There won’t be much gap between a $49 book from Dymocks or the digital $99 version, particularly in non-fiction/edu titles. What that says about the paper book market is interesting. Interesting opinion piece in today’s ZDNet Australia that supports my views around tablets and content – with David Braue writing that telcos are missing a trick by not bundling content with their tablet plans: http://www.zdnet.com.au/telcos-ignoring-tablet-commandments-339322319.htm.